Post Toasties Who Ate My Post Toasties Ad 1955, This is a September 12, 1955 advertisement. It is a nice color ad from Post. Pictures a small boy at the table shaking an empty box of Post Toasties. Dad is hiding behind his newspaper and the boy is saying, Who ate my Post Toasties. Picture by Darrow. In mint condition. Photo is taken through plastic and may show wrinkles or crookedness that is not in the ad. This magazine tear sheet measures 10 1/4"" wide by 14"" tall. 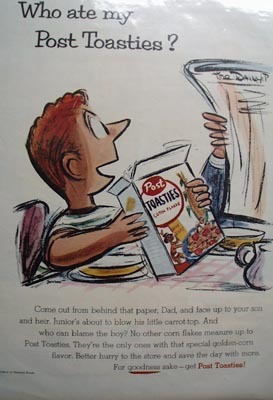 Items Similar To "Post Toasties Who Ate My Post Toasties Ad 1955"